Gather round, kitties. Grab a cuppa warm liquid cheer to hear a winter’s tale of survival. A story about the rescue of a frozen cat. And above all, a cautionary tale. Imagine being an outdoor kitty cat. It’s hard. Very hard. 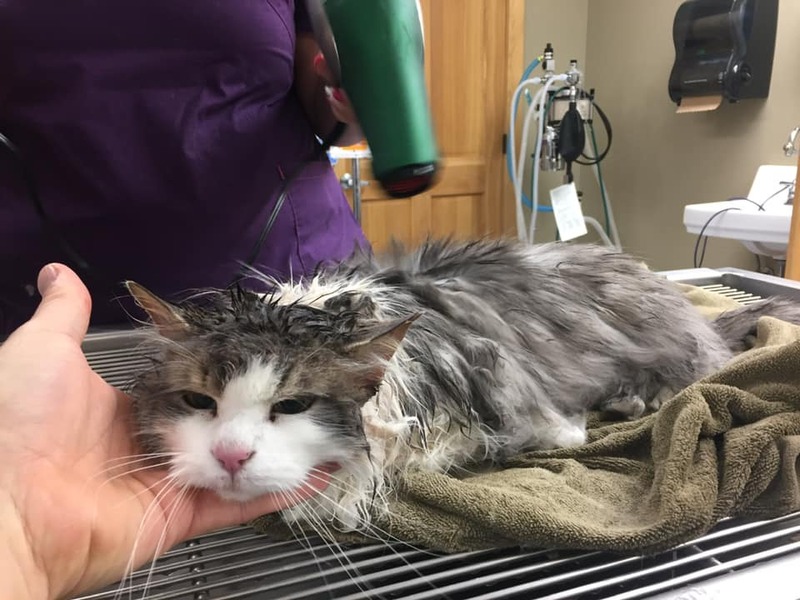 Outdoor kitties have a rough go of it, especially in Northwest Montana. Being an outdoor cat in maybe St. Louis is tough enough, but Montana winters are especially challenging. Snowfall in Kalispell measures over double the national average. Here the cold is colder and snow is deeper than most parts of the country. It’s not just tip-toeing through the snow flakes. The sub-zero wind chill and steady snow of early February proved too much for the brave outdoor kitty from Kalispell now known as Fluffy. Fluffy sort of “came with the territory” when a new family moved in to her area a few years ago. 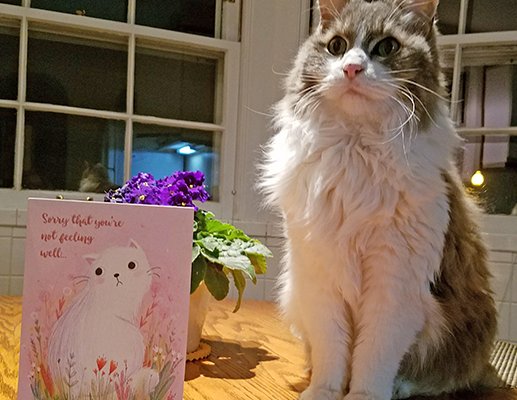 The family looks out for Fluffy, but she has remained an outside kitty. That may soon change. She was found injured and frozen in a snow bank, perhaps just in the nick of time. 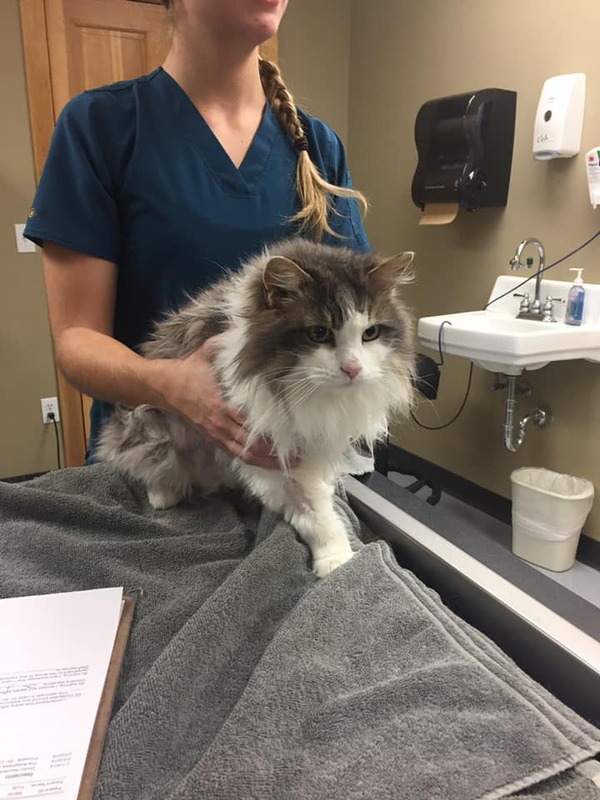 The family rushed the frozen Fluffy to Animal Clinic of Kalispell, where the team led by Dr. Jevon Clark gradually thawed out the ice covered cat. As fuzzy snowball’s temperature rose about ten degrees, Fluffy regained her catitude. 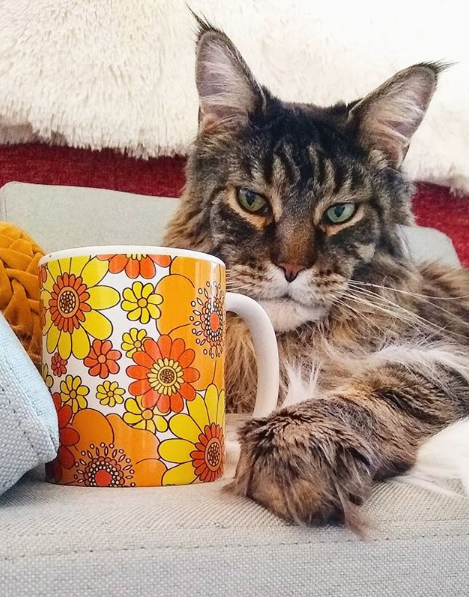 Fluffy is recuperating inside her people’s home and warming hearts across the internet. Cheers to Dr. Clark and his team, and Fluffy’s adopted family. 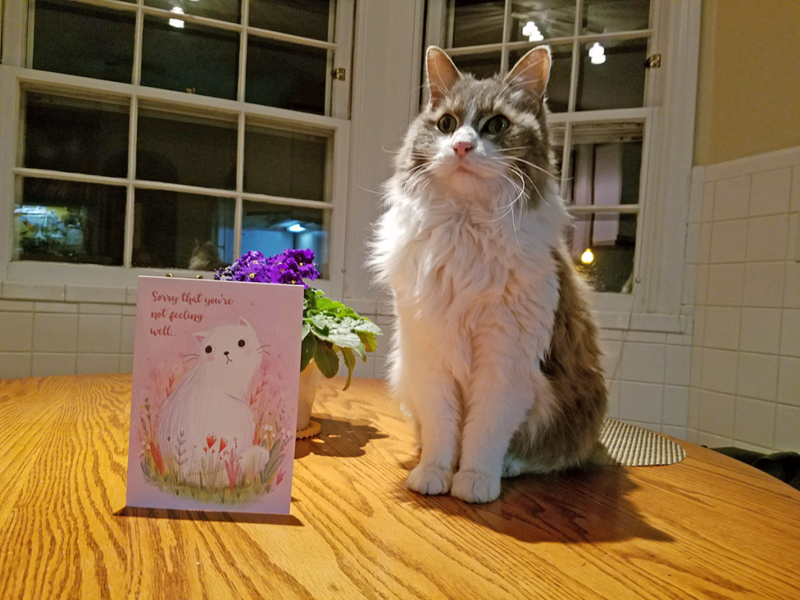 Here at That Cat Life, our resident cat is sending warm wishes to the recovering Fluffy. We think there’s more than a snowball’s chance our Sporty is a distant cousin to the lucky Montana cat. At the least, he’s a doppelganger: same pink nose and flint tinged fluff. Most telling is the kindred independent spirit! Be well and stay inside, Fluffy! Oh, my goodness, this poor cat! Thank goodness she was found and saved. The amount of snow and ice on this poor kitty is horrific. I hope she is able to become an indoor cat now. I’m so glad they found the cat in time! We rescued our cat when she was just a kitten. We lived in Florida and it was one of the few nights we were supposed to have freezing temperatures when a momma cat walked on our porch with 4 kittens. Momma eventually moved on and 3 out of 4 went with her. One did not and cried on my porch for 30 minutes. When momma didn’t come back I brought her in. She had fleas and scabies but we got her fixed up and she’s been our family pet for over 8 years now! A dog that was adopted from the rescue I work with escaped 2 weeks ago and I’m so worried for him. Between the very cold temps and all the snow I’m hoping he found somewhere warm. Winter can be so hard on animals. Poor kitty! I’m so happy that she was found and that “her humans” took immediate action to get help. WOW that snow covered picture is insane. With the crazy temperatures that have been going across the country glad she was rescued and saved! Omg poor kitty!!! These types of stories break my heart since I’m a cat lady. Glad the kitty was dethawed and is doing better! That poor kitty! I am glad they found her in time! I hope she is no longer afraid of going into/being in these nice people’s home, now that they’ve saved her! That’s so great that they were able to take care of and resuscitate the cat. I hope they are able to find a great home. Definitely deserve one. What an emotional story! I’m so glad that the kitty is recuperating. Yay to everyone who helped. I think too often, people forget that their pets are affecting by the cold harsh temperatures just like humans are. I’m so glad to hear that this kitty is recuperating. I am glad that they found that cat in time. It’s really important for the pet rescues to stay open for that reason! 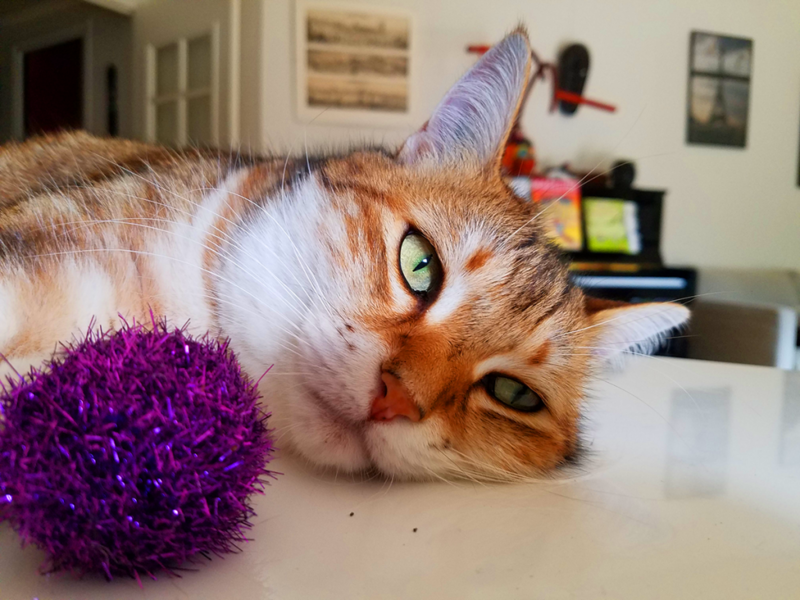 Beautiful kitty – I’m glad she was saved.